What conditions does Hyophen treat? Tell your doctor right away if you have any serious side effects, including: hot/dry/flushed skin, decreased sweating, eye pain, difficult urination, signs of kidney problems (such as change in the amount of urine, painful urination). Get medical help right away if you have any very serious side effects, including: easy bruising/bleeding, black/tarry stools, stomach/abdominal pain, vomit that looks like coffee grounds, signs of liver problems (such as unusual tiredness, dark urine, persistent nausea/vomiting, stomach/abdominal pain, yellowing eyes/skin). This drug may rarely cause an attack of extremely high blood pressure (hypertensive crisis), which may be fatal. Many drug interactions can increase this risk (see Drug Interactions section). Get medical help right away if any of these serioussevere headache, fast/slow/irregular/pounding heartbeat, chest pain, neck stiffness/soreness, severe nausea/vomiting, sweaty/clammy skin (sometimes with fever), widened pupils, vision changes (such as double/blurred vision), sudden sensitivity to light (photophobia). List Hyophen side effects by likelihood and severity. Before using this medication, tell your doctor or pharmacist your medical history, especially of: kidney problems, liver problems, urinary blockage problems, difficulty urinating (such as due to an enlarged prostate), stomach/intestinal disorders (such as obstruction, ulcers), glaucoma (narrow angle type), heart problems (such as coronary heart disease, congestive heart failure, fast/irregular heartbeat), high blood pressure, myasthenia gravis, bleeding/clotting problems, certain enzyme deficiencies (pyruvate kinase or G6PD deficiency), aspirin-sensitive asthma (a history of worsening breathing with runny/stuffy nose after taking aspirin or other NSAIDs), growths in the nose (nasal polyps), stroke, severe/frequent headaches, a certain kind of adrenal gland tumor (pheochromocytoma), dehydration. What should I know regarding pregnancy, nursing and administering Hyophen to children or the elderly? This medication may interact with many products. Some products include: apraclonidine, atomoxetine, bupropion, buspirone, carbamazepine, cyclobenzaprine, dextromethorphan, maprotiline, methotrexate, mifepristone, potassium capsules/tablets, pramlintide, tetrabenazine, some narcotic drugs (such as fentanyl, meperidine, methadone, tapentadol), certain Parkinson's disease drugs (entacapone, levodopa, tolcapone), certain high blood pressure drugs (guanethidine, methyldopa), sulfonamide drugs (including sulfa antibiotics such as sulfamethoxazole), sympathomimetics (such as amphetamine, ephedrine), tricyclic antidepressants (such as amitriptyline/nortriptyline), products that decrease the amount of acid in the urine (such as antacids, sodium bicarbonate, potassium/sodium citrate, acetazolamide). Does Hyophen interact with other medications? 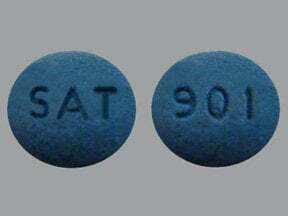 This medicine is a blue, round, tablet imprinted with "SAT" and "901". Are you considering switching to Hyophen? How long have you been taking Hyophen?